Please note, this is not a Prometheus Trust publication - however we do hold stocks for direct sales, and we offer our normal 20% discount for UK customers and 5% for European customers. Postage is free to customers in the UK and Europe. We can also sell to customers in the rest of the world except the US and Canada. The Eternal Law takes the reader on a fascinating journey through some of the most profound questions related to our understanding of modern science. What does it mean to say that there is an eternal mathematical law underpinning all of physical reality? How must we expand our narrow conception of science to include not only logic but also intuition, consciousness, and the pursuit of beauty, symmetry, simplicity, and unity? Is truth objective, or is it nothing more than a whimsical projection of opinions? Why were many of the key founders of modern science inevitably drawn to ancient Greek philosophy? Spencer’s extraordinary clarity helps to restore a sane vision of reality, while deepening our appreciation of what Einstein called 'the mysterious'. 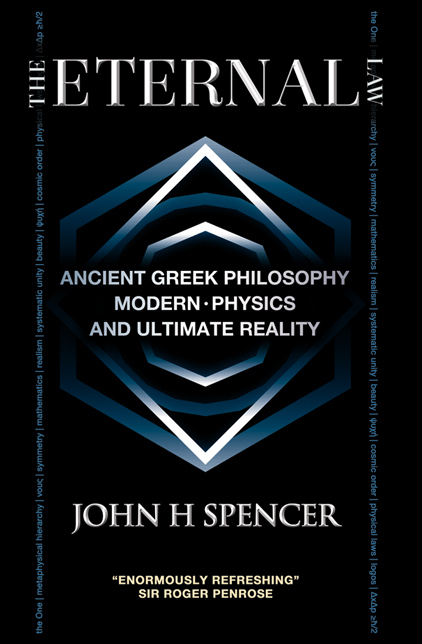 "I found John Spencer's The Eternal Law to be enormously refreshing; for here we have someone willing to speak out forcefully in favour of Platonic ideals lying at the roots of modern science.” Sir Roger Penrose (OM FRS), Emeritus Rouse Ball Professor of Mathematics, Mathematical Institute, University of Oxford, author of The Road to Reality. "An important contribution to the philosophical and scientific exploration of the concept of reality." Dr. Mario Beauregard, Department of Psychology and Neuroscience Research Center, The Université de Montréal, author of Brain Wars.
" . . . immense value to teachers in both the sciences and the humanities, and to everybody who wants to live with an enlightened understanding of the world." Dr. Lothar Schäfer, Distinguished Professor of Physical Chemistry (emeritus), University of Arkansas, Fayetteville, author of In Search of Divine Reality: Science as a Source of Inspiration.
" . . . Accessible to non-specialists, this richly interdisciplinary book remains highly relevant to philosophers, classicists, physicists, and historians of science." Dr. John E. MacKinnon, Department of Philosophy, Saint Mary’s University. "This is an exciting and thought-provoking book from a young scholar whose base is in the philosophical foundations of quantum physics, but who has gone on as well to master the whole philosophical tradition, particularly that of Platonism, to bring us a wide-ranging study of the parameters of reality. All of us can learn from it." -- Dr. John Dillon, Regius Professor of Greek (Emeritus), Trinity College Dublin, author of The Middle Platonists: 80 B.C. to A.D. 220. "This robust defence of ancient thought, objective truth and metaphysical realism also provides along the way a most valuable education in philosophy, philosophy of science and the history of science . . ." Dr. Stephen D Snobelen, History of Science and Technology Programme, University of King’s College. "This book gives a spirited defence of the continuing importance of Platonic philosophy. The author shows how Pythagorean and Platonic ideas influenced the thinking of the creators of modern science, from Kepler in the seventeenth century to the founders of quantum mechanics in the twentieth" Dr. Stephen M. Barr, Professor of Particle Physics, University of Delaware, author of Modern Physics and Ancient Faith. “The poison of anti-realism has been dripped into the ear of modern humanity for too long, bringing with it a curious fever of body and lethargy of mind: The Eternal Law is an antidote of the finest potency. The author exposes the fatal contradiction at the heart of anti-realism with such ruthless clarity that I strongly suspect anyone trying to defend it after this will only succeed in further demonstrating its absurdity.” Tim Addey, Chairman of the Prometheus Trust, author of The Seven Myths of the Soul.